If I tell you that each book in this series just gets more and more exceptional, will you believe me? Or will you believe that I, like Eugenides, am simply telling you a version of the truth to get you to do what I want you to do? (In this case, to get you to read these books yesterday). Both things are true, by the way. 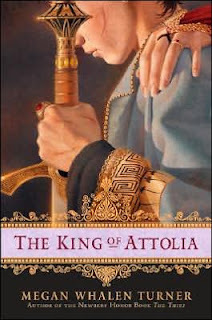 The King of Attolia is even better than its predecessor and I will tell you anything to get you to read these books. Yesterday. Plus, check out my favorite cover of the three. Look at the feather scar on his cheek. Her hand on his shoulder. His grip on the sword. So awesome. Eugenides has just embarked upon his self-imposed life of exile in Attolia. And to any and all onlookers, he is ill at ease in his new home. The queen appears to despise him, the court thinks him an idiot of epic proportions, and the guard are ready to murder him on their queen's behalf. The story follows a young lieutenant named Costis who is having a shockingly bad day. In a fit of righteous indignation, he hauled off and punched the king in the face in front of several witnesses, including the captain of the guard. Certain he will hang in the morning, Costis is shocked and discomfited to find himself assigned to be the king's personal assistant. Forced to serve the man he hates, Costis soon finds himself on the receiving end of a most unorthodox education of a lifetime. Through his eyes, the reader gets an intimate, exquisitely poignant look at the relationship between the King and the Queen of Attolia. This third installment is the big payoff in many ways. The Thief set up the key characters, briefly sketching out their backgrounds and motivations--all against a background of a grand quest--and it did it with humor and style. The Queen of Attolia delved into the complicated psyches of the two main players, word by artfully chosen word, making your heart ache for them, ensuring you fall in love with them. The King of Attolia cements the whole gorgeous package. This is where Eugenides comes into his own. This is where you realize he's smarter than you. And so is Megan Whalen Turner. And you wouldn't have it any other way. This book is the real deal. Every scene is choice. Every sarcastic exchange. Every vicious riposte. Every hidden glance. It's a rereader's paradise and, as Oscar Wilde said, "If one cannot enjoy reading a book over and over again, there is no use in reading it at all." The King of Attolia is so worth it. I can already tell I will be reading about these characters for the rest of my life. I have heard nothing but raves about this series. Time to go dig up a copy. What else is there to say to this review except "Yes, yes, and a thousand times, yes!"? Charlotte, I believe it. I actually can't wait to reread it. And I have lurked a little around the Sounisians. Lovely place, lovely people. RJ, a MWT blurb?! *applause* Bet that was a good day. What a great review! As an avid, repeat reader of the series I heartily concur with every word! Rachel, thank you! What a find she was. Final proof I'm a hopeless stalker and can't keep my nose out of anything on the web to do with these books! Definatly come snoop around Sounis, like RJ said! We always welcome new converts!! My love for this book knows no bounds. I am glad you commented on the cover-it is gorgeous and the artist really "got" the characters. It reminds me slightly of The Scarlet Pimpernel where most think he is a fop but actually he is brillant. And in any book has there ever been a better sword/fight scene than at the end? You also need to listen to the audioversions. I picked up things listening to it that I had missed by reading it. All the audioversions are good, but KOA is brilliant-Costis really comes alive. Eddis (LOVE the name btw), stalkers welcome here. Of the book variety, that is...:) 2010 cannot come fast enough. My mind boggles at how awesome #4 is sure to be. Will definitely stop by soon! Michelle, thanks for mentioning The Scarlet Pimpernel. There is a definite similarity there! And the sword/fight scene? Brilliant. Sophos, heir to Sounis, doesn’t look like much of a prince. At least, according to those in power. At least, to those who do not know him or the size of his heart and the depth of his courage, loyalty, and love. But Helen, Queen of Eddis, knows him, and so does Gen, the queen’s Thief, who is now King of Attolia. Gen and the queen believe that Sophos is dead. But they also believe in hope, especially since a body was never found. So when Sophos is discovered in Attolia, climbing a lamppost, peashooter in hand, the obvious question becomes: where has Sophos been all this time? Click the read more button if you want to read the blurb on the website. God, I am so excited. I can't wait till march.